I try to read about 80 blogs a week. Most of them are related to writing, productivity or creativity and these missives inspire me, inform me and, occasionally, enrage me. One that fell into that last category this week was headlined, “15 Essential Tips For Becoming a Better Writer.” Unable to ignore a come-on as compelling as that, I clicked immediately. Wowser! What a disappointment. If I’d hoped for any new ideas, I was misguided. The tips consisted of such painfully obvious suggestions as “read a lot,” “research a lot,” and, “make writing simple.” Really? Do you think any of those tips will help? Grammar and spelling is very important when you write something. The writer should be fluent and expert in grammar and spelling. So, make sure to brush up on the fundamental theories and standards of writing, grammar and spelling. 1-The “fundamental theories and standards” of grammar and spelling are a life’s work. They are scarcely something you can just “brush up” on. The blogger makes this fluency sound no more daunting than reviewing a short list of irregular verbs. But, in fact, people who are good at grammar and spelling, have worked hard at it, probably have some natural ability with it and were usually blessed with parents who were able to reinforce these skills when their children were young. This usually excludes anyone who was born of parents who spoke English as a second language or anyone born in poverty where parents understood that putting meals on the table and paying rent was more important than grammar or spelling. 2-Too much focus on the mechanics of spelling (and grammar) puts the focus on the least important part of the exercise: the package in which the ideas are wrapped. In fact, writing should be judged on whether it expresses interesting, provocative or creative ideas. I would rather read a stimulating piece with appalling spelling than a boring piece spelled to perfection. No contest. Writing is about communicating. If you don’t have something useful to say than the perfection of the delivery is irrelevant. 3-Many great writers over the years have been abysmal spellers. Here is a partial list: William Faulkner. F. Scott Fitzgerald. Ernest Hemingway. John Keats. John Irving. Jane Austen. Winston Churchill. Agatha Christie. W.B. Yeats. Benjamin Franklin. This does not make them bad writers. It simply makes them bad spellers. 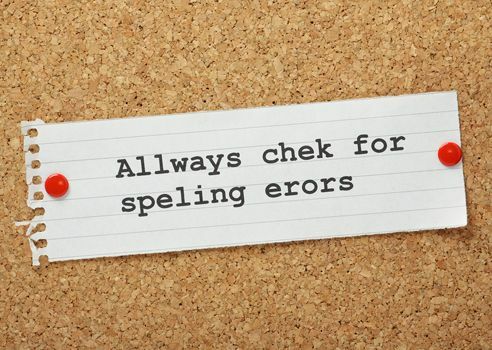 You can read more about these writers’ spelling problems here. 4-Copy editors (paid or volunteer) can fix spelling and grammar. Note that I’m not suggesting published work should be filled with errors. Far from it. But copy editors are professionals who fix these mistakes. And if you can’t afford one, there are many “natural” copy editors in our midst (I find many smart admin assistants are often excellent copy editors). Moms and dads will also usually work at no charge. As well, you can use the no-cost version of services such as grammarly. 5-The author of the blog post made an error in his own point about the importance of grammar and spelling. He wrote, “Grammar and spelling is very important,” when he should have written, “Grammar and spelling ARE very important.” I don’t want to make fun of him, which would be unkind, but it’s hard to overlook the irony of a mistake in this very short paragraph. “Too much focus on correctness interrupts the flow of ideas. Furthermore, teachers want students to understand that good writers revise their pieces many times for structure, development, clarity and voice. Although the mechanics are important for polish, correct spelling can’t make up for a poorly structured, underdeveloped piece of writing. And if a piece is going to be revised several times, it makes no sense to keep correcting the mechanics, only to have those words dumped entirely in a later revision. My conclusion? Don’t worry about your spelling until you sort out your ideas, first. And if you have a disability that makes spelling impossible for you, then assign the job to someone else. Are you looking for some support for a book or thesis that you’re working on? There are two spots left in my Get it Done program starting July 1. The program always sells out so, if you think you might be interested, check it out and consider applying today. My video podcast last week explained how to select and manage beta readers. See it (or the transcript) here and consider subscribing. If you have a question about writing you’d like me to address, be sure to send it to me by email, twitter or Skype and I’ll try to answer it in the podcast. Are you a natural speller or do you struggle with the task? We can all learn from each other so, please, share your thoughts with my readers and me in the “comments” section below. Anyone who comments on today’s post (or any others) by June 30/17, will be put in a draw for a copy of Writing to Learn by William Zinsser. Please, scroll down to the comments, directly underneath the “related posts” links, below. Note that you don’t have to join the commenting software to post. See here to learn how to post as a guest.